This is about Slötorp-Dåseberga version 2 which is a great deal larger than version 1. The theme is the same and where the environment is closely the same they share the same people and vehicles. 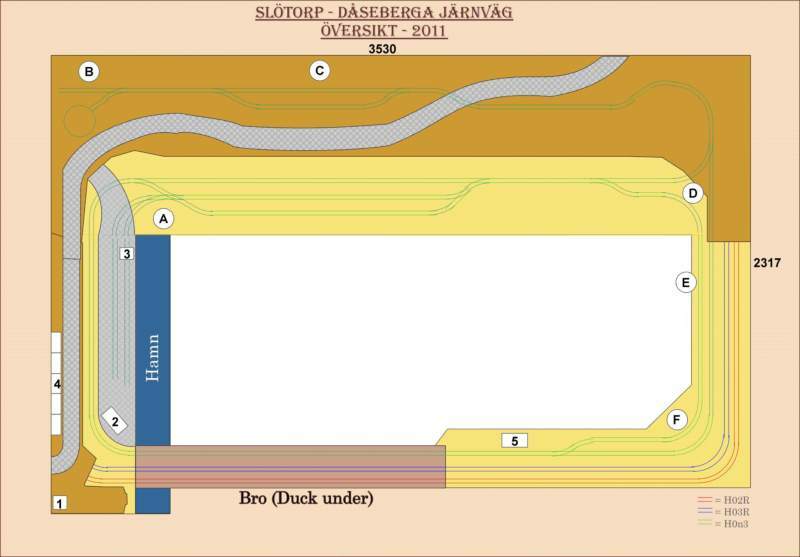 Slötorp-Dåseberga version 2 is planned as a round the walls layout as shown below. This somewhat pale picture above shows what is going to be the main line creating background traffic during runs. The red line is H0 2R (Fleischmann, Roco, Lima, etc.) and the blue line is H0 3R (Maerklin). By building one circle of each kind I avoid having to re-build rolling stock as I run it all using a digital (DCC) control system. 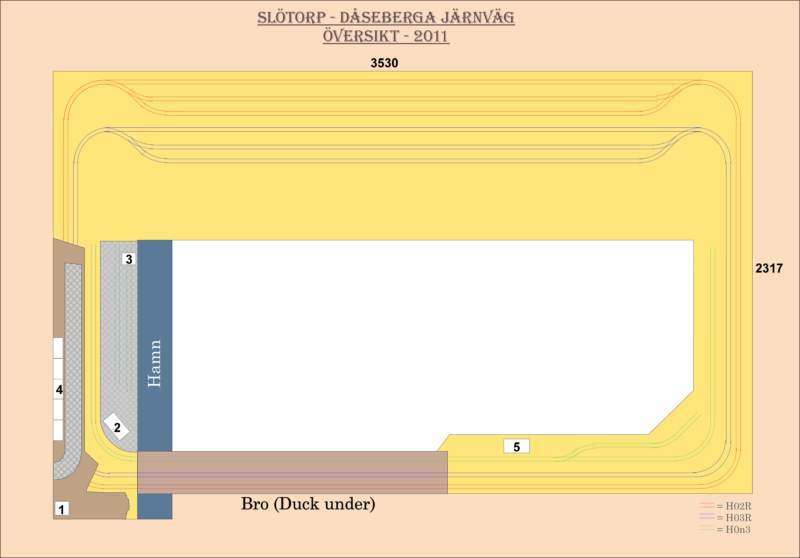 The brownish section in the lower part of the picture is a so called "duck under" to provide means for easily entering into the center of the tracks. This is just half the layout. The other half is shown in next picture. In this picture there is a third green track which is the H0n3 narrow gauge track. This is quite close to common Swedish 891 mm or 3' narrow gauge. This part of the layout does require a lot more building and construction as nearly nothing exists to purchase directly over the counter, but there is also much of the charm I think. The numbers and letters means are explained below. 1 - Dåseberga Lighthouse, The horbour lighthouse on the hill. 2 - Harbour office. with pilot, customs, harbour captain and rederi. 3 - Harbour cranes. Ordinary harbour cranes, Gothenburg style. 4 - HSB-block. Apartment houses along the road to Dåseberga. 5 - Branten Station with coal yard and water spout for steam engines. A - Connection from harbour to station. B - Slötorp Loco shed and the end of the line. D - The triangular track, makes it possible to turn trains round. E - "Photo straight", an unusually straigt part of the line for photoing. F - Farm Corner, one of the corners with a farm. As new details and items are added the list above will be extended. It is on these web pages where upadtes will be presented before being included here so do not miss looking in there as well.